SPRINGFIELD (April 15, 2016)–Advocates from Equality Illinois and the AIDS Foundation of Chicago–including a transgender university student and the mother of a transgender child–met with Gov. Bruce Rauner and legislators this week in Springfield to advance a pro-LGBT equality agenda during the spring session of the General Assembly. In a meeting in the Governor’s Office arranged by Equality Illinois, the advocates urged the governor to support a bill to modernize birth certificate changes for transgender Illinoisans (HB 6073), to oppose a second measure that would stigmatize and discriminate against transgender students (HB 4474), and to adopt a responsible budget that protects vital services for Illinoisans. 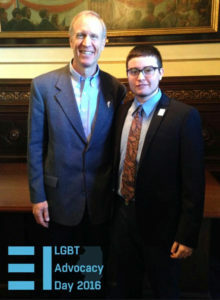 Finn DeLima, a transgender student at Southern Illinois University in Carbondale, spoke with the governor about his personal experiences and explained why legislation modernizing the state’s birth certificate law is critical for transgender Illinoisans to be able to live authentically. The mother of a transgender child also urged the governor to oppose HB 4474, which would force transgender students to use separate school facilities from their peers. The citizen advocates were at the Illinois Capitol on Wednesday for Equality Illinois’ 2016 LGBT Advocacy Day to add their voices to Equality Illinois’ professional bipartisan lobbying team. They met with their legislators to urge them to advance a lived equality for lesbian, gay, bisexual and transgender (LGBT) Illinoisans and their families. Advocates hailed from communities across Illinois, including Belleville, Benton, Bloomington-Normal, Carbondale, Champaign-Urbana, Chicago, Elgin, Litchfield, Marion, Monmouth, Peoria, Rockford, and Springfield. “Equality Illinois and our partners are working hard to share information with our legislators about the harm caused by anti-LGBT bills such as HB 4474. We are also asking them to pass the birth certificate bill because having updated identification documents is important to transgender Illinoisans who may face embarrassment, discrimination, and harassment if their core documents do not reflect their authentic gender identity,” said Patty Medairy, Director of Field Operations at Equality Illinois. Advocates also met with Illinois Senate President John Cullerton to thank him for his long-standing support of LGBT equality. He encouraged the citizen advocates to keep up the fight for equality and inclusion in Illinois. Community partners for LGBT Advocacy Day included UP Center of Champaign County, Illinois Safe Schools Alliance, Rainbow Cafe, Coalition of Rainbow Coalitions (CORAL), and Planned Parenthood Action Fund. The day concluded with a reception at the Illinois State Library, where participants shared their lobbying experiences and recommitted themselves to continue working to achieve a lived equality for all LGBT Illinoisans.